Spencer's Island was a shipbuilding centre during the Age of Sail. 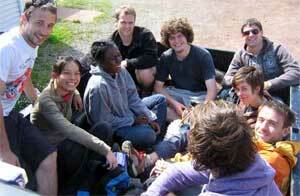 Students from Dalhousie's Faculty of Architecture and Planning worked in Spencer's Island for their free lab. Dalhousie students are helping a Nova Scotia village to assert its connection to one of the worldÕs most puzzling and enduring mysteries Ñ the Mary Celeste. No one knows what happened back in 1872, when the ship was found in full sail off the Azores with nobody aboard. The captain, his wife and two-year-old daughter, and the seven-member crew were inexplicably missing. From time to time, tourists have arrived in SpencerÕs Island, a rural community located on the Bay of Fundy down the shore from Parrsboro. They want to see where the famed brig was built and speculate with the locals about what may have happened. ÒI think we should reclaim her. She was built here and sheÕs still an unsolved mystery," says Laurie Currie, who lives in SpencerÕs Island (which is actually on the mainland but is named for a nearby island) with his wife Cindy and three daughters. 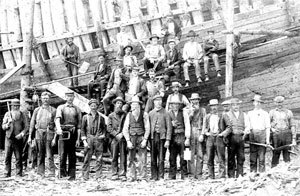 Mr. CurrieÕs idea was to build a replica of the Mary Celeste in the community and, along the way, bring back the trades and knowledge that have been lost. In the 19th century, SpencerÕs Island was an important ship-building centre. With the help of Dalhousie architecture students, Mr. CurrieÕs dream has started to take shape. Ten students with the Faculty of Architecture and Planning and their professor Roger Mullin spent two weeks in July living in the community, coming up with a concept, meeting with residents, and making it real Ñ and all on a budget less than $1,000. ItÕs called a free lab and finishes off the academic year for undergraduate and graduate students. Besides the SpencerÕs Island project, other free labs included building a bicycle shed out of rammed earth near the Halifax Commons and creating a medicinal garden with First Nations people in Pictou Landing, N.S. Ò(After being in school), we really crave this," says Paul Zylstar, who is working on his MasterÕs of Architecture. ÒI think (the free labs) bring a lot of people to Dalhousie. You brainstorm, toss around ideas and then you can see something coming together. I like that you get to think with your hands a little bit." For SpencerÕs Island, the challenge was to create a public space while paying tribute to the rich shipbuilding history of the area, says Prof. Mullin. Of course, the other challenge was to work and live together in close quarters without driving each other crazy. - 1860: The Amazon is built in SpencerÕs Island, N.S. 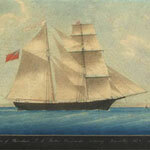 ItÕs later renamed the Mary Celeste. - 2007: Mary Celeste is evoked in an outdoor cinema in SpencerÕs Island. ÒWe came up with the idea of an outdoor cinema as a public space where people can watch stories together. We thought this was a great first step," explains architecture student Kimberly Fuller, from Westbank, B.C. ÒAesthetically, we played with the measurements of the Mary Celeste to make our first moves for the seating area. From there we began using old farm equipment to assist in our design. And, to build the screen, we learned a few sailing knots and lumbering techniques from a man in the community." Built on land donated by the Currie family for public use, the outdoor cinema evokes the Mary Celeste in many ways: the students recreated the 32-metre line of the hull and keel in stone and salvaged wood Ñ forming a seating area Ñ and the double mast, which serves as a film screen. Facing the canvas screen is a projector, tucked inside a viewing tower five metres tall that looks like a lighthouse. Once residents saw the students at work, they were keen to pitch in. Materials were donated; the use of an excavator was made available; people were generous with their time and expertise. When the project was unveiled to the community at an event at the end of July, more than 100 people turned out. ÒThe project seemed to fill us all up with hope," says Kerr Canning, a retired professor who has a cottage in the area. ÒAt the event, every spot there was to sit down was filled. For some of the younger generation, this was very exciting Ñ finally something of interest to them was happening. Others were curious. People liked seeing the young people working. It warmed our hearts and people wanted to see what they had done." Those good feelings were mutual. ÒThe locals really did appreciate the idea of the outdoor cinema. I think this is why our team was so enthusiastic Ñ people were so positive," explains Justin Sylvestre, a student in the Environmental Design Studies program. ÒThis turned into an amazing experience for all of us." Now Laurie Currie isnÕt dreaming solo. A nonprofit group is being formed to operate the cinema and there are plans to expand. Other ideas include an interpretative centre devoted to the Mary Celeste and a vendor location for local artisans and trades people such as kayak builders, blacksmiths and sailmakers. ÒItÕs been an education for all of us Ñ a wonderful education," says Mr. Currie. ÒYou know, thereÕs a photo in my attic showing 15 majestic sailing vessels moored in the bay. Those days are in the past, but letÕs see if we can bring a little of it back and make this a thriving community again." A view of the site: The double mast of the screen, the keel (in wood), the line of the hull in stone, and the projection tower.